In Layer Setting page, users are allowed to long press and drag the layer to reorder the layers. page, “select all fields” is supported. Support to set the transparency of layers (including vector layer, SGT layer, and layer from SuperGIS Server) to enhance the map display. 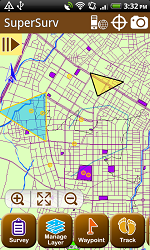 Users are allowed to set the tolerance of map manipulation to more easily select the features or functions they need. Support “Feature Measurement” function; SuperSurv supports to display the XY coordinate of point feature, length of line feature, perimeter and area of polygon features. Support “Feature rotation” functions. In editing, users can set the anchor and rotate the feature to edit the features more flexibly. Support “Snapping” function; users can set the tolerance for editing. 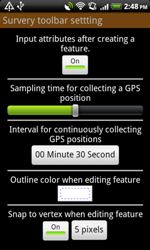 In editing the vertex of features, SuperSurv can help users to s snap the vertex that is within the tolerance range. Support to show waypoints via Augmented Reality; SuperSurv supports to apply Augmented Reality to show theSupport to show waypoints via Augmented Reality; SuperSurv supports to apply Augmented Reality to show the position of waypoint and the straight distance between current position and the waypoint. 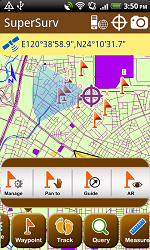 Users can choose the display the e-compass with the map to recognize the real direction the users is heading.